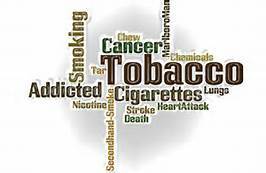 Tobacco contains nicotine, an ingredient that can lead to addiction, which is why so many people who use tobacco find it difficult to quit. There are also many other potentially harmful chemicals found in tobacco or created by burning it. The nicotine in any tobacco product readily absorbs into the blood when a person uses it. Upon entering the blood, nicotine immediately stimulates the adrenal glands to release the hormone epinephrine (adrenaline). Epinephrine stimulates the central nervous system and increases blood pressure, breathing, and heart rate. As with drugs such as cocaine and heroin, nicotine increases levels of the chemical messenger dopamine, which affects parts of the brain that control reward and pleasure. Smoking is a fashion statement, proving a point on self-image and most of the time the effects of nicotine is irreparable. Passive smoking with smokers around is as harmful as the actual smokers. Emotional addictions like ego boosting, self-esteem built on opinions of others that puts people in to a cage of their thoughts also stimulates a person to smoke tobacco. Addiction of any kind is dangerous as dependency on any object makes one obsessive. We find teenagers of today a bit anchorless and they find their emotional booster in their smart phones. Posting of cool pictures in the social media, the number of likes that is expected out of it, makes people keep their addiction window open to everything. Drug abuse in today’s world is very alarming as we keep getting mails and calls in lifenliving.org seeking help by them. There must be an awareness program and of course life changer projects that goes a bit deep in to our ancient culture and heritage to help families and the people who get abused and attacked by this tobacco terror. Confused global culture, overwhelming modern environment, racing with people on social media, lack of communication at home and breaking marriages, single parenting and there are many more issues that makepeople roll themselves in to the tobacco leaves. Tobacco terror has gripped the world more than any other disease and it is time to wake up and seek help. There are people willing to hand hold you out of this wound. Previous PostPrevious Are you feeling low?